The Canadian Review of Social Policy/Revue canadienne de politique sociale is a scholarly and bilingual journal of progressive social policy. It aims to promote the exchange of ideas amongst a network of people involved in education, the public sector and social movements in the field of Canadian social policy and administration. CRSP/RCSP publishes analyses of historical and current developments, issues, debates, and reviews of recent publications. Learn more about our different subscriptions that give unlimited access to our archives and new issues for a full year. We welcome new submissions from Canadian and international scholars on subjects focusing on Canadian and comparative Canadian social policy. Welcome to issue 76 of The Canadian Review of Social Policy/ Revue Canadienne de Politique Sociale, continuing our engagement with progressive scholarship and research on Canadian social policy! We hope you are challenged by these critical explorations of Canadian social policies. Bienvenue au volume 76 de la Revue Canadienne de Politique Sociale/ Canadian Review of Social Policy, où nous continuons notre engagement avec la politique sociale progressive canadienne! Nous espérons que ces explorations critiques de politique sociales canadiennes vous interpelleront. For Professional Educators, What Is ‘Meaningful Collaboration’? by Dr. J.C. Blokhuis, University of Waterloo. A book review by Dr. Tobin LeBlanc Haley: “Disability, Right Monitoring, and Social Change: Building Power Out of Evidence" (2015) Edited by Marcia H. Rioux, Paula C. Pinto and Gillian Parekh. Toronto: Canadian Scholars' Press. A book review by Nicole Leach: "Purchase for Profit: Public-private partnerships and Canada's health care system" (2015) by Heather Whiteside, Toronto: University of Toronto Press. "CRSP is pleased to launch our first issue devoted to the scholarship of graduate students in Social Policy / Social Work. The articles in this issue demonstrate a keen commitment to social policy and equity issues in relation to how history, culture, workers, and youth are positioned and shaped to keep dominant voices, ideas and actors at the helm of public life." "RCPS est ravie de présenter sa toute première édition dédiée au travail de recherché des étudiants de cycles supérieurs en politique sociale et en travail social. Les articles dans cette édition démontrent un engagement indéfectible pour la politique sociale et les questions d’équité reliées à l’histoire, à la culture, aux travailleuses et travailleurs, et aux jeunes qui sont positionnés et configurés afin de garder les voix, les idées, et les acteurs dominants en charge de la vie publique." You also can subscribe to our journal online with an individual ($60/yr) student ($30/yr) or institutional ($150/yr) subscription. We would like to thank the dedicated work of our anonymous reviewers who made this issue's publication possible, as well as the School for Social Work and York University for providing in-kind support without which we could not function. We hope you enjoy this issue of emerging and challenging research in social policy. Finally, but not least we would like to thank you, our readers, for continuing to support progressive social policy researh and scholarship in Canada. 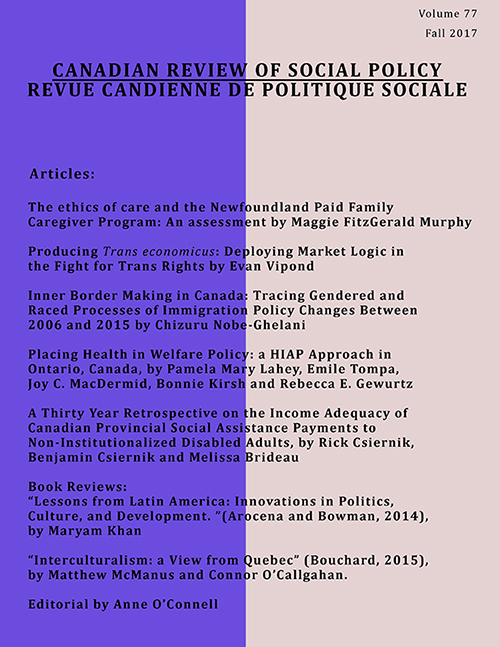 Welcome to issue 74 of The Canadian Review of Social Policy/ Revue Canadienne de Politique Sociale, continuing our engagement with progressive scholarship and research on Canadian social policy! In this general issue 74 articles address issues faced by vulnerable populations in Canada. We hope you are challenged by these critical explorations of Canadian social policies. Bienvenue au volume 74 de la Revue Canadienne de Politique Sociale/ Canadian Review of Social Policy, où nous continuons notre engagement avec la politique sociale progressive canadienne! Dans cette édition 74 les articles abordent des problématiques rencontrées par certaines populations vulnérables au Canada. Nous espérons que ces explorations critiques de politique sociales canadiennes vous interpelleront. With an editorial by Wendy McKeen. Participation des personnes assistées sociales à la mesure de formation de la main-d’oeuvre (MFOR): Caractéristiques et résultats de fin de participation par Ysabel Provencher, Rachel Lépine et Hans Ivers. Playing with motherhood: The politics of leisure and the transition to motherhood in Montreal and Toronto by Stephanie Paterson, Dawn Trussell, Shannon Hebblethwaite, Meredith Evans, and Trisha Xing. A book review by James Michael FitzGerald, of Shauna MacKinnon’s “Decolonizing Employment: Aboriginal Inclusion in Canada’s Labour Market”, published in 2015 by the University of Manitoba Press. A book review by Rebecca Jane Hall of “Northern Communities Working Together: The Social Economy of Canada’s North” edited by Chris Southcott, published by University of Toronto Press in 2015.